It just so happened that I was watching Heston Blumenthal's "In Search of Perfection" on the same day that my dear Sean requested some peanut butter cookies. For those not familiar with the show, it follows the Michelin-starred chef as he seeks out the quintessential recipe for various dishes. Whether it be Peking duck or risotto, Mr. Blumenthal looks to understand every aspect of the recipe, studying (in great detail) the importance and contribution of each ingredient, preparation and cooking method. In this episode he tackled trifle. He examined its historical origins, researched the way tastes move around the human palate, and considered the effects of temperature on textural perception. A fascinating half hour later he presented his final imagining of the dessert - complete with saffron syllabub, strawberry jelly and a sweetened olive pureé. Throughout the exercise, I could not help but compare his to the "standard" trifle that appears on our holiday table; a base of fluffy lemon-scented sponge, then scarlet-red raspberries staining layers of creamy custard and mascarpone cream, all topped off with bronzed shards of almond brittle. A far cry from Mr. Blumenthal's version, but my family will settle for nothing less. And although this trifle has been deemed "perfect", I am still one to tweak things a little, depending on the fruit available, the audience I am serving or to better suit my whims. Now I was thinking about the search for perfection, and the infinite possibilities when it comes to food. Every person perceives things differently, every person responds to flavours and textures in their own way. Every person has their own set of memories that are conjured by a smell or a taste. Each of us has a different set of criteria to satisfy; the journey towards finding the definitive form of any dish really is, well, endless. But I digress. Back to Sean's request. While he had provided me with a recipe for his cookies (from Martha Stewart's cookie book) I could not help but delve a little deeper. When I asked him what kind of peanut butter cookie he was looking for, Sean immediately replied "soft and chewy." 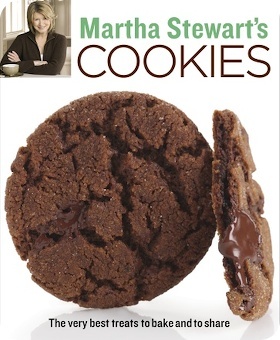 The Martha recipe sounded perfectly delicious, but the photo showed a cookie that looked more crisp than tender. After that, I consulted Dorie Greenspan's book for her advice, but came away empty handed. In the end, I combined a few recipes, and drew upon my experience with baking. Albeit a bit unorthodox in measurements, I patched together a recipe that uses brown sugar for tenderness and caramel tones, granulated sugar for body and a bit of crispness, salt for added depth, and crunchy peanut butter for texture. Upon first bite, Sean declared these the best he'd ever had. Not too bad for a first try. I am already thinking about what to change on my next attempt. Living up to their title, these cookies are unbelievably tender. A great candidate for ice cream sandwiches - with a dulce de leche filling perhaps? Although I specify chunky peanut butter, that was only for personal preference. This recipe would work perfectly well with smooth. In the bowl of a stand mixer with the paddle attachment, or with a hand mixer, cream together the butter and peanut butter until light and fluffy. Add the sugars and beat on high for three minutes, scraping down the sides of the bowl as needed. Add the dry ingredients to the bowl and stir to just combine. Refrigerate the batter for 10-15 minutes to set up and chill thoroughly. Using a 1 1/4" ice cream scoop dish out mounds of dough onto the prepared baking sheet (alternatively, use a generous 2 tablespoons of batter for each cookie), spacing them about 2 inches apart. Dip a fork into warm water and use the tines to press the dough balls lightly; you only want to slightly flatten their shape and leave the imprint of the fork. Freshly dip the fork between pressing each cookie. Sprinkle with sea salt, if desired. Bake in the preheated oven for 18 minutes, rotating the sheets once during baking. Cool on pan for two minutes, then remove to a baking rack to cool completely. 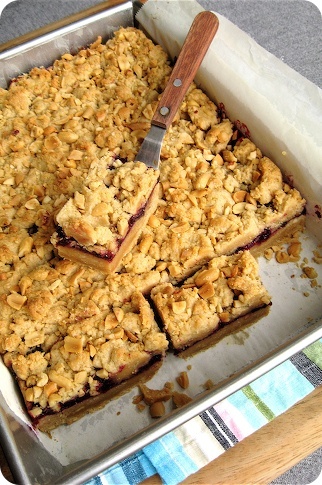 • For a crisper cookie, bake for 20 minutes. 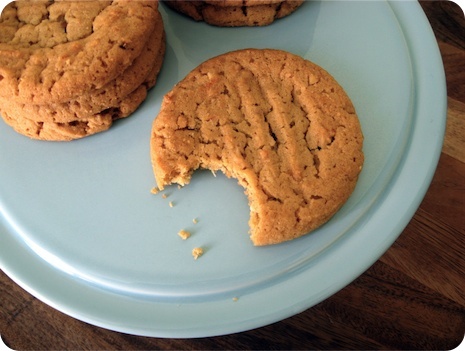 • Toffee bits, chopped peanuts or chocolate chips would all be great additions to this cookie.